What do kiddie pools, cold bandannas and frozen water bottles all have in common? They’re great ways to keep your dog cool during the long, hot days of summer. You can easily have fun in the sun (and the shade) with your pooch all summer long. Just plan ahead and make sure you have ways for you both to stay cool. It’s no secret dogs don’t sweat like humans do rather they cool off by panting. If you’re in hot weather for long periods, watch for signs of dehydration: excessive drooling, bloodshot eyes and extreme lethargy are all signs your furry friend needs a little help. Dogs cool from the bottom up. They also stand on hot asphalt and concrete with their bare paws. This can lead to burned paw pads for some dogs. Protect your dog’s paws with traction socks or all-weather booties. You can even wet them before putting them on your pet to help them stay cooler longer. You can also add a wet bandanna around your pet’s neck to help cool him down. Want to prolong the cool? Wet the bandanna under running water, wring it out so it’s soaked through and roll it up like your dog will wear it later. Then, pop it into the freezer for an hour or so. When you’re ready to go, presto! You have a super chilled bandanna for your chill pup. Carry extra water for both of you and a travel dish if you’ll be out and about. Be sure to offer it to your dog frequently. Heat dangers vary depending on what you’re doing of course. 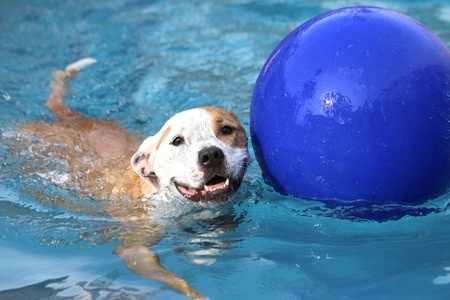 Simply sitting around in a backyard isn’t likely to endanger either one of you but you can make it more comfortable for your pet with a kiddie pool full of cool water if your dog is the water loving type. Your dog may also use the opportunity to dig a little hole and lay against the cool earth – whether you want him to do this or not is up to you. If you’re out hiking, you’ll want to take frequent breaks and carry plenty of water for your dog. Don’t ever leave your dog in the car alone during a hot day. Even in the shade, a car can heat up past 109 degrees in just 15 minutes. Imagine how that feels to your friend in the fur coat. Ouch! Do you both a favor, if it’s too hot; just leave your pet panting in the air conditioning. What summer fun do you have planned with your pet this summer?